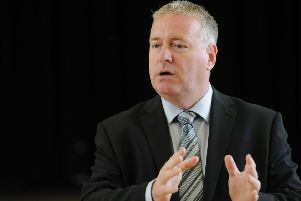 Blyth Valley MP Ronnie Campbell is pressing the Government to explain why the region’s schools are falling badly behind in national league tables. He will quiz Education Secretary Justine Greening on new statistics from Whitehall departments which he says confirm that the region’s youngsters are being denied the opportunity to go on to further education, apprenticeships and decent jobs. The figures show that the North East has the highest proportion of underperforming secondary schools, with 17.2 per cent of schools falling behind the minimum expected standard in 2016-17, compared to 9.3 per cent nationwide and 3.1 per cent for London. He slammed the proposed funding formula changes which he said will amount to a real-terms decrease. Mr Campbell added that if per-pupil funding were matched between London and the North East, there would be an additional £360million available. The figures also show that in 2016, 89 per cent of headteachers surveyed in the North East reported problems recruiting; despite regional improvement on the whole, Ofsted ratings for Northumberland schools have declined over the past five years; and the North East has the highest percentage of NEETs (not in education, employment or training) at 17.6 per cent. In addition, one in three adults in the North East has the literacy levels of a nien to 11-year-old, and one in five has the numeracy levels of a five to nine-year-old. And the North East has the lowest number of pupils who stay in education for at least two terms after Key Stage 4.